Do you lob the baby out with the bathwater? I mean do you pitch peels of potatoes into the garbage bin? Well, you could just be forsaking a storehouse of nutrients. Potato skins are loaded with disease-fighting nutrients and healthy weight-friendly fibre. Half the spud’s fibre is in the skin, which is also brimming with potassium and immunity-boosting vitamin C. The skin also contains B vitamins, calcium and is rich in phytochemicals. Potato skin contains no fat, no cholesterol and no sodium. 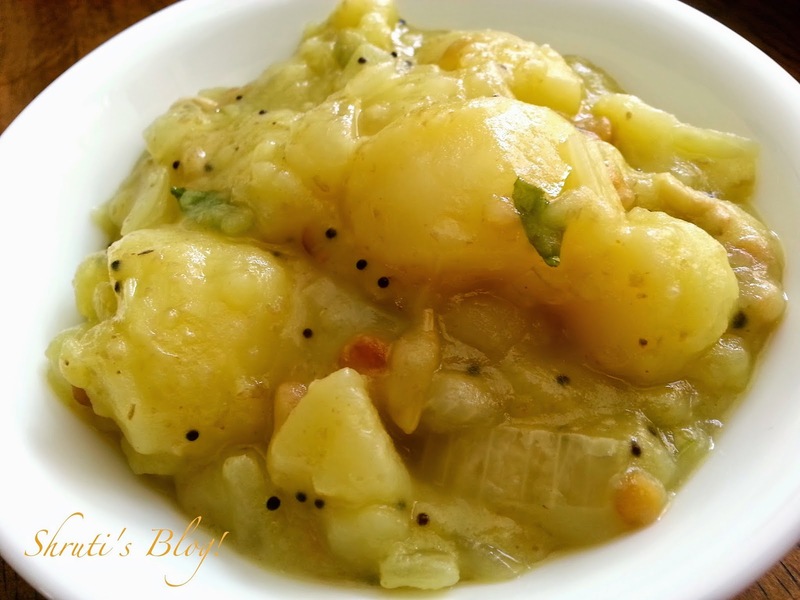 I hardly ever remember Aai peeling potatoes and this has influenced my cooking. Wherever possible, I don’t peel the potatoes. The only time I concede to “peel pressure” is if the peel isn’t very clean or is a bit green. At other times, for less understandable reasons, I give in to “peer pressure” in presenting a more standard or aesthetically pleasing peeled potato dish. However, recently – thanks to my foodie uncle, Jayant Mama, I have started using pureed peel in potato preparations and even in the most unexpected dishes. Needless to say, it allows me to retain both the appearances of the dishes and the advantages of the peel. I am so sold on my own spiel, that I will have to stop myself from binning the flesh and cooking only with the skin the next time I boil potatoes! For now, I present my most favourite potato bhaji made with both the skin and flesh. 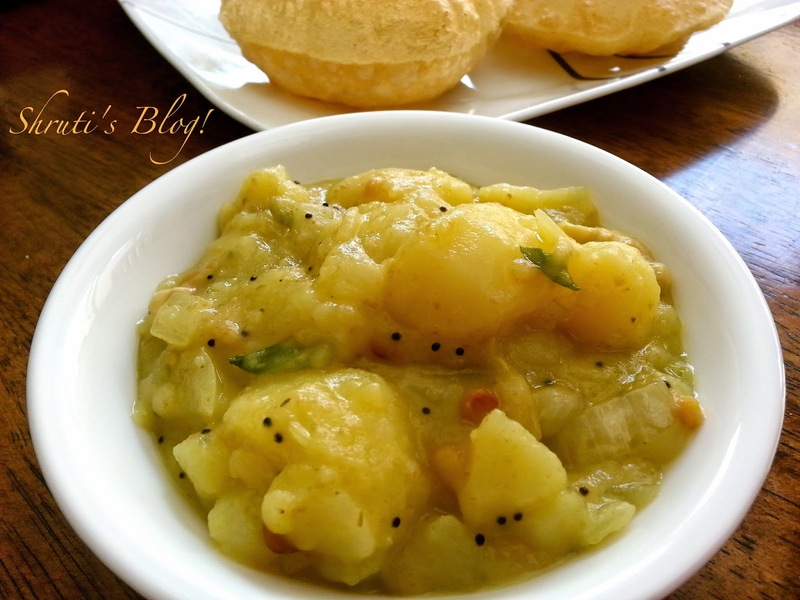 Do watch out for more recipes with potato peel puree! This is the closest I have got to the quintessential masala dosa kind of bhaji from Tajmahal Hotel (Udupi) of my childhood, or the poori-bhaaji type of saagu from Shanbhag Hotel. Over the years, I have seen restaurants adding peas, tomatoes, carrots and what-have-you to this bhaji, but the beauty of this bhaji is in its simplicity as presented. Thoroughly brush and wash potatoes and boil until tender. Drain and peel them and set the peel aside. Roughly crumble them with a fork or by hand keeping some bits large. As a child, I used to treat the occasional large lump of potato in a masala dosa as serendipitous bonus. Even that extra-large piece of onion raked out of the recesses of the roll added to the experience. Heat oil in a pan and when hot, add the chana dal and the urad dal. Stir and fry for a few seconds until the dals turn just a shade darker, then add mustard seeds to splutter. Next, add the chopped cashews and curry leaves and stir-fry for about 30 seconds and then add the chopped onion, chillies and ginger and sauté for a few minutes until the onions are translucent. Take care not to burn the chillies. Blend the skins into a smooth puree with a cup of water and add it to the onions. Cook on low heat for about 10 minutes, stirring in between until the onion softens completely. Add salt, a pinch of sugar / sweetener and turmeric and mix well. Then incorporate the roughly crumbled potatoes into this mixture. Check adjust the salt and remove from heat. Serve hot as masala rolled up in a dosa, or with hot puffed pooris.